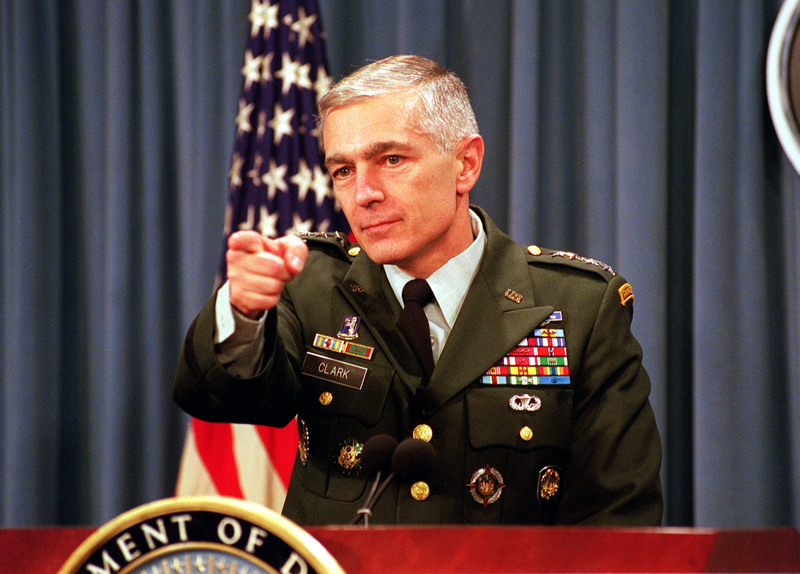 General Wesley Clark (image right) , NATO’s Supreme commander in Europe, confirmed in late May  that « NATO’S air campaign has not reached its peak yet and the alliance should be prepared for more civilian casualties. ». General Clark also confirmed that « he would be seeking to increase the number of air strikes in Kosovo and expand the range of targets. Ethnic Albanians have not been spared by NATO air raids. Killing ethnic Albanians in Kosovo is said to be « inevitable » in carrying out a « humanitarian operation on behalf of ethnic Albanians ». In addition to the impacts of the ground war between the KLA and the Yugoslav Armed Forces, the bombings and the resulting radioactive fall-out in have been more devastating than in the rest of Yugoslavia. With the « diplomatic shuttle » still ongoing, the Alliance is intent on inflicting as much damage on the Yugoslav economy (including Kosovo) as possible prior to reaching a G8 brokered « peace initiative » which will empower them to send in ground troops. « Allied commanders have steadily widened their list of economic targets… Increasingly, the impact of NATO air strikes has put people out of work… causing water shortages in Belgrade, Novi Sad and other Serbian cities. … [T]he effect was to shut down businesses, strain hospitals’ ability to function and cut off water… »4. In this regard, NATO’s military intervention in Yugoslavia (in violation of international law) also sets a dangerous precedent. It provides « legitimacy » to future military interventions. To achieve its strategic objectives, national economies are destabilised, regional conflicts are financed through the provision of covert support to armed insurgencies… In other words, the conflict in Yugoslavia creates conditions which provide legitimacy to future interventions of the Alliance into the « internal affairs of sovereign nations ». In late April, Georgia, the Ukraine, Uzbekistan, Azerbaijan and Moldava signed a pact in Washington, creating GUUAM, a regional alliance which lies strategically at the hub of the Caspian oil and gas wealth, « with Moldava and the Ukraine offering [pipeline] export routes to the West ».9 This geopolitical split bears a direct relationship to the crisis in Yugoslavia. The region is already unstable marked by nationalist conflicts and separatist movements. Moreover, Russia’s military has also voiced its concern « that the bombing of Yugoslavia could turn out in the very near future to be just a rehearsal for similar strikes on Russia. »12. 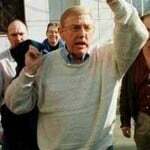 Public « disapproval » of NATO bombings is immediately dismissed as « Serb propaganda ». Those who speak out against NATO are branded as « apologists of Milosevic ». While most anti-War critics in NATO countries are not defenders of the Milosevic regime, they are nonetheless expected to be « balanced » in their arguments. « Looking at both sides of the picture is the rule »: anti-war commentators are invited to echo NATO’s fabricated media consensus, to unequivocally « join the bandwagon » against Milosevic. Under these circumstances, an objective understanding and analysis of the role of the Milosovic government since the civil War in Bosnia and in the context of the present crisis in Kosovo has been rendered virtually impossible. It is also worth mentioning that the UK government (whose Prime Minister Tony Blair is among the list of accused in one of the parallel law suits) has provided The Hague Tribunal with « intelligence on the situation within Kosovo » since the beginning of the bombings.22 Part of this intelligence material was relayed by the KLA with which British Foreign Secretary Robin Cook has been in frequent contact as well as through British Special Forces (SAS) directly collaborating with the KLA. 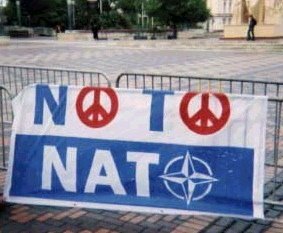 Carefully removed from the public eye, preparations for both « the air campaign » and « the ground War » have been ongoing for almost a year prior to the beginning of NATO’s « humanitarian bombings » on March 24th 1999. On 24 September 1998, another key UN Security Council Resolution (UNSCR 1199) was adopted which called « upon the authorities in Belgrade and the leadership of the Kosovar Albanian community urgently to enter without preconditions into a meaningful dialogue on political status issues. » It also required Belgrade to withdraw its troops from Kosovo. Under the impending threat of air strikes, a partial withdrawal was carried out by Belgrade (following the adoption of UNSCR 1199) creating almost immediately conditions for the KLA to occupy positions previously held by retreating Serb forces. In turn, the strengthening of the KLA was accompanied by renewed terrorist activity and a consequent « worsening of the security situation ». NATO’s hidden objective, in this regard, was to use the KLA insurgency to further provoke ethnic tensions and generate social strife in Kosovo. Following the agreement between US envoy Richard Holbrooke and President Slobodan Milosevic, Yugoslavia was to complete negotiations on « a framework for a political settlement » by the 2nd of November 1998. Moreover, a Verification Mission to establish compliance with resolutions UNSCR 1160 and UNSCR 1199, was put in place in Kosovo under the auspices of the Organization for Security and Cooperation in Europe (OSCE). A parallel NATO air verification mission (complementing the OSCE verification mission) was established following an agreement signed in Belgrade on 15 October 1998 by the Yugoslav Chief of General Staff and NATO Supreme Allied Commander for Europe, General Wesley Clark. The terms of both the OSCE and NATO verification agreements were subsequently embodied in UNSCR 1260 of October 24th. Whereas Belgrade was given a 96 hour « deadline for compliance », the Alliance decided to postpone the initiation of air strikes following talks in Belgrade (October 25-26) between President Slobodan Milosevic and General Wesley Clark. According to the Alliance statement: « NATO will remain prepared to carry out air operations should they be necessary » 38. In the meantime, NATO launched Operation Eagle Eye using unarmed aircraft and unmanned predator aerial vehicles (UAVs). Eagle Eye surveillance activities were coordinated with the « ground verification » mission conducted by OSCE observer teams and by the Kosovo Diplomatic Observer Mission (KDOM). In the meantime, a career US diplomat, Ambassador William G. Walker [see image on the right] was appointed Head of the OSCE Kosovo Verification Mission (KVM). A tailor-made assignment: Walker was well-known for his role in the « Iran-Contragate » scandal during the Reagan administration. The KLA insurgency was in many regards a « carbon copy » of the Nicaraguan Contras which had also been funded by drug money with covert support from the CIA. « Eventually, even the Los Angeles Times joined in, running a story entitled « Racak Massacre Questions: Were Atrocities Faked? » The theory behind all these exposs was that the KLA had gathered their own dead after the battle, removed their uniforms, put them in civilian clothes, and then called in the observers. »44. In the meantime, while supporting the KLA insurgency on the ground, the Alliance had also contributed to spearheading KLA leader Hashim Thaci (a 29 year « freedom fighter ») into heading the Kosovar delegation to Rambouillet, on behalf of the ethnic Albanian majority. The Democratic League headed by Ibrahim Rugova had been deliberately side-stepped. The Alliance was relying on its KLA puppets (linked to organised crime) to rubber-stamp an agreement which would have transformed Kosovo into an occupied territory under NATO military rule. While negotiations were ongoing in Rambouillet, NATO decided to increase the readiness of its assigned forces « so as to make them able to execute the operation within 48 hours ».46 In other words, « peace negotiations » had been initiated in Rambouillet (contrary to the Vienna Convention) under the threat of impending air strikes. NATO had granted a three weeks period to the parties meeting in Rambouillet to conclude negotiations. In other words, the proposed invasion force was to be more than double that under Rambouillet (28,000 troops) while also enforcing all the normative clauses of the initial Rambouillet agreement including the « free movement » of NATO combat units throughout Yugoslavia. In the meantime, NATO’s military establishment was forcing the pace of international diplomacy. The Alliance hinted in May that a ground offensive could be launched prior to reaching a « peace agreement » sanctioned by the G8 and ratified by the United Nations Security Council. « We’ve already put quite a lot of troops in Macedonia as the nucleus of that operation », said British Foreign Secretary Robin Cook. « There are over 12,000 there already… and last weekend [14-15 May] we committed another two and a half thousand to go there. We need to build up – actually we need to build up now… »50. In late May, the 60,000 troops target was revised to 150,000. Alliance officials estimating that « if the alliance later decides to mobilize for a land attack … an invasion force could number more than 150,000 soldiers. »51 Prime Minister Tony Blair in a separate statement had (without any form of parliamentary debate) confirmed the sending of 50,000 British troops as part of the 150,000 invasion force. The US House of Representatives (in what appeared to be a partisan « anti-Clinton » vote) has declined to even endorse the air campaign while signifying its refusal to authorize a « ground war » without congressional approval. In early April, Republicans and Democrats joined hands in the House and threw out a proposed « declaration of war on Yugoslavia » by an overwhelming 427-2 vote. Echoing the barrage of self-serving NATO propaganda, the media scam now consists in skilfully portraying Alliance ground troops as bona fide « peace-keepers ». Public opinion should not be deluded as to the meaning of a G8-UN brokered diplomatic solution. An « international presence » consisting largely of NATO troops under the G8 proposal (ratified by the Serbian Parliament in early June) could include a token participation of « non-NATO forces » including Russia and the Ukraine. While Moscow agreed in early June that all Yugoslav forces be withdrawn from Kosovo alongside the disarmement of the KLA, Russian envoy Viktor Chernomyrdin nonetheless insisted that the command structure of the proposed international force be under the control and jurisdiction of the United Nations. In the meantime, the Alliance, however, had persisted in maintaining a unified NATO command structure (which was unacceptable to Moscow and Belgrade). NATO has also stepped up the bombings as a means of pressuring Belgrade into accepting (without prior negotiation) NATO’s « five conditions ». If the G-8 proposal were to be ratified, NATO would first send in US Marines into Kosovo from the 26th Marine Expeditionary Unit in the Adriatic Sea. The Marines would be part of a so-called « Enabling Force » prior to the moving in of a force of 50,000 troops. A G-8 « peace proposal » (implying a de facto military occupation of Kosovo) could be formally ratified at the Cologne G7-G8 Summit in mid-June. All G7 heads of government and heads of State together with President Boris Yeltsin will be in attendance at Cologne in what is hoped to be a highflown display of unity in favour of a (G8 sanctioned) NATO led invasion. NATO nonetheless warned in early June that should the diplomatic initiative not succeed, the Alliance would proceed with a ground invasion involving 150,000 troops…. These « special forces » are « advising the rebels at their strongholds in northern Albania, where the KLA has launched a major recruitment and training operation. According to high-ranking KLA officials, the [British] SAS is using two camps near Tirana, the Albanian capital, and another on the Kosovar border to teach KLA officers how to conduct intelligence-gathering operations on Serbian positions ».56 In May, three French special forces officers wearing uniforms of the French Armed Forces (« Parachutistes ») were reported killed on the Albania-Yugoslavia border by the Yugoslav daily Vecernje Novosti. According to the French daily Libration, the three men were allegedly « instructors in charge of coordinating ground war activities by the KLA… »57. « [B]y early December 1997, Iranian intelligence had already delivered the first shipments of hand grenades, machine-guns, assault rifles, night vision equipment, and communications gear… Moreover, the Iranians began sending promising Albanian and UCK [KLA] commanders for advanced military training in al-Quds [special] forces and IRGC camps in Iran…58. The KLA has also been provided with « a long-term training deal with Military and Professional Resources International [MPRI], a mercenary company run by former American officers who operate with semi-official approval from the Pentagon and played a key role in building up Croatia’s armed forces [during the War in Bosnia]. »64 And General Brigadier Agim Ceku (despite his role in « ethnic cleansing » in Bosnia), is currently collaborating closely with the Pentagon’s mercenary outfit MPRI on behalf of the KLA. A self-proclaimed provisional KLA government of Kosovo has been established. With KLA leader Hashim Thaci as Prime Minister designate, the KLA has already been promised a central role in the formation of a « post-conflict government ». 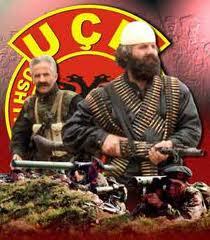 The KLA military regime had replaced the duly elected (by ethnic Albanians) civilian provisional Kosovar government of President Ibrahim Rugova. In a statement issued in April, the KLA considered the (parallel) « parliamentary elections » organised by the Democratic League and held in March 1998 to be invalid. Wall Street analysts concur that « war is good for business » particularly during a period of « economic slowdown ». The US Congress has approved increased budgetary allocations to finance the War in Yugoslavia which will result in multi-billion contracts for America’s Defense industry. In turn, the War will boost the military-industrial complex and its related high tech sectors in the US and Western Europe. A ground war combined with a prolonged military occupation (as in Bosnia) will prop up military spending. In turn, covert support and financing of « freedom fighters » (extending beyond the Balkans into Central Asia and the Middle East) will contribute to boosting the lucrative contraband in small arms for an expanding market of insurgent nationalist movements. The « post conflict » agenda (under the proposed G8 « peace initiative » consists in establishing in Kosovo an occupied territory under Western administration (broadly on the same model as the 1995 Dayton Agreement imposed on Bosnia-Herzegovina). « Free market reforms » are envisaged for Kosovo under the supervision of the Bretton Woods institutions. Article I (Chapter 4a) of the Rambouillet Agreement stipulates that: « The economy of Kosovo shall function in accordance with free market principles ». In close liaison with NATO, the Bretton Woods institutions had already analyzed the consequences of an eventual military intervention leading to the military occupation of Kosovo: almost a year prior to the beginning of the War, the World Bank conducted « simulations » which « anticipated the possibility of an emergency scenario arising out of the tensions in Kosovo ».72 The « simulations » conducted in Washington have in fact already been translated into a panoply of « emergency recovery loans » for Macedonia and Albania, and there is more to come… Since the imposition of the embargo, Yugoslavia, however, is no longer considered a member of the Bretton Woods institutions and will not be eligible for IMF-World Bank loans until the sanctions are lifted. The eventual « reconstruction » of Yugoslavia formulated in the context of the « free market » reforms and financed by international debt largely purport to create a safe haven for foreign investors rather than rehabilitate the country’s economic and social infrastructure. The IMF’s lethal « economic medicine » will be imposed, the national economy will be dismantled, European and American banks will take over financial institutions, local industrial enterprises which have not been totally destroyed will be driven into bankruptcy. The most profitable State assets will be transferred into the hands of foreign capital under the World Bank sponsored privatisation programme. In turn, « strong economic medicine » imposed by external creditors will contribute to further boosting a criminal economy (already implanted in Albania and Macedonia) which feeds on poverty and economic dislocation. In turn, the so-called « reconstruction » of the Balkans by foreign capital will signify multi-billion contracts to multinational firms to rebuild roads, airports and bridges which will eventually be required (once the embargo is lifted) to facilitate the « free movement » of capital and commodities. The proposed « Marshall Plan » financed by the World Bank and the European Development Bank (EBRD) as well as private creditors will largely benefit Western mining, petroleum and construction companies while fuelling the region’s external debt well into the third millennium. And the countries of the Balkans are slated to reimburse this debt through the laundering of dirty money in the domestic banking system which will be deregulated under the supervision of Western financial institutions. Narco-dollars from the multi-billion dollar Balkans drug trade will be recycled (through the banking system) and channeled towards servicing the external debt as well as « financing » the costs of « reconstruction ». The extensive destruction of Yugoslavia, would normally require the Alliance to « pay war reparations » to Belgrade. However, following a pattern set in both Vietnam and Iraq, the Alliance will no doubt compel Belgrade « to pay for the costs » of Operation Allied Force (including the cruise missiles and radioactive shells) as a condition for the « normalisation of relations » and the lifting of the economic embargo. Similarly Baghdad has been « billed for the costs of the Gulf War », – –ie. accumulated Iraqi debts including private claims against Iraq have been carefully recorded by a special unit of the UN Security Council. The recognition of these debts by Baghdad at some future date will be a condition for the lifting of sanctions on Iraq. International Action Center, « NATO Bombing Unleashes Environmental Catastrophe in Europe », Press Release, 14 May 1999). Joseph Fitchett, « Is Serb Economy the True Target? Raids Seem Aimed at Bolstering Resistance to Milosevic », International Herald Tribune, Paris, 26 May 1999. Dr. Mary-Wynne Ashford, « Bombings Reignite Nuclear War Fears », The Victoria Times-Colonist. 13 May 1999, page A15. Mary-Wynne Ashford is co-president of the Nobel Peace Prize winning IPPNW. 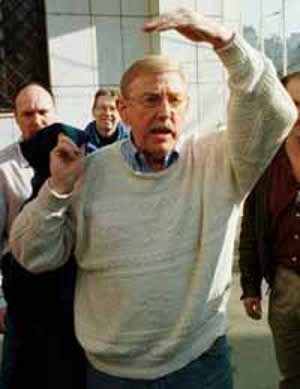 See « Lawyers Charge NATO Leaders Before War Crimes Tribunal », Toronto, 6 May 1999. See « Lawyers Charge NATO Leaders Before War Crimes Tribunal », Toronto, 6 May 1999; see also Jude Wanniski, « Memo to US House Majority Leader », Polyconomics, New York, 10 May 1999. See, Roland Keith, « Failure of Diplomacy, Returning OSCE Human Rights Monitor Offers A View From the Ground in Kosovo », The Democrat, May 1999. US Department of Defense Press Release, 6 April 1999. The stated purpose of the mission was « to discuss a range of security issues with the recent ethnic clashes in Kosovo. » In Skopje, the agenda consisted in examining security arrangements to be implemented after the termination of United Nations UNPREDEP programme. See Federation of American Scientists, « Operation Determined Force », 24 March 1999, see also Financial Times, October 12, 1998. 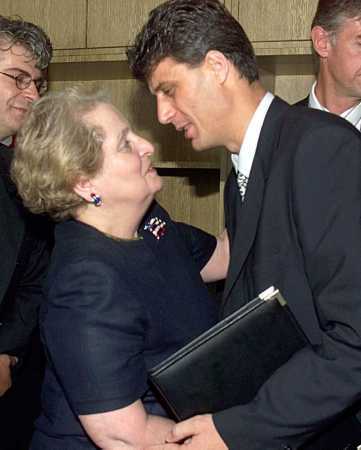 « Margaret Warner talks with Cook about the latest developments in the Yugoslav conflict », Jim Lehrer News Hour, 21 May 1999. Chris Steven, « Bin Laden Opens European Terror Base in Albania », Sunday Times, London, 15 November 1998. « War Crimes Panel Finds Croat Troops ‘Cleansed’ the Serbs, » New York Times, 21 March 1999. « US Is Trying to Reconcile Ethnic-Albanian Separatists », Belgrade, Tanjug Press Dispatch, 30 May 1999. See Michael Radu, « Don’t Arm the KLA », CNS Commentary from the Foreign Policy Research Institute, 7 April, 1999).